Vaccines are “immunogenic formulations” intended to protect vaccinated individuals by inducing production of antibodies and cell-mediated immune responses to combat infectious (and sometimes noninfectious) conditions. Historians trace the roots of modern vaccinology—the science of vaccine development—to the dicey practices of smallpox inoculation and variolation that began in the 1700s. About a century later, in 1885, Pasteur developed and administered a rabies vaccine to humans. Although these and other early vaccines produced mixed real-world results and generated warnings of potentially serious postvaccinal complications, mass vaccination nonetheless took off without a backward glance. Many traditional vaccines are built around a lab-weakened (attenuated) version of a live virus (or, less frequently, a bacterium). Examples of live-attenuated vaccines include measles-mumps-rubella (MMR), varicella (chickenpox), rotavirus, shingles and, in some countries, tuberculosis (BCG). Because live antigens provide continual “stimulation,” the Centers for Disease Control and Prevention (CDC) proclaims this type of vaccine “the closest thing to a natural infection.” Even in weakened form, however, live pathogens can mutate toward greater virulence and reversal of attenuation; these types of vaccines, therefore, always come with “a degree of unpredictability.” The live-attenuated shingles vaccine, for example, has been linked to serious vaccine-related adverse events such as asthma exacerbation, polymyalgia rheumatica, congestive heart failure and pulmonary edema. Moreover, with insufficient inactivation, the pathogen may linger as a stealth agent capable of causing disease. In the latter part of the 20th century, vaccine scientists began moving beyond simple attenuation or inactivation of pathogens toward greater manipulation of genes and antigens as well as more complex strategies to activate and sustain immunity. 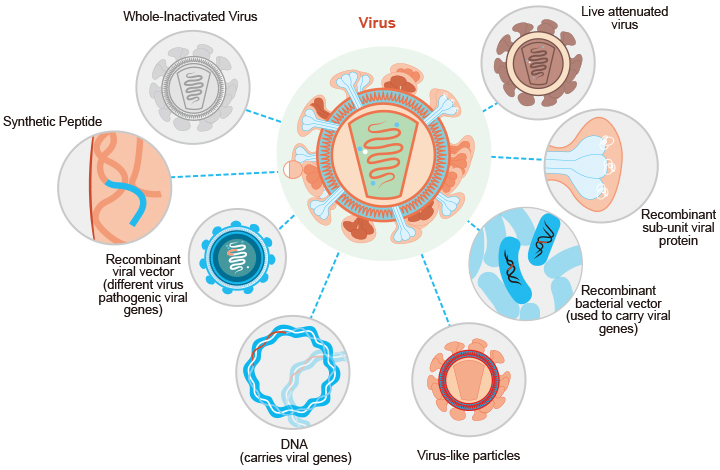 The somewhat overlapping categories of subunit, recombinant, polysaccharide and conjugate vaccines all refer to vaccines that use specific components of a pathogen as antigens rather than the pathogen in its entirety. Subunit vaccines seek to zero in on and isolate “any specific part of the pathogen which has been demonstrated to stimulate a protective immune response.” Production of subunit vaccines can involve breaking apart a microbe with chemicals to collect the antigens of interest, or, increasingly, using recombinant DNA technology (gene splicing). Examples of the latter are the recombinant hepatitis B and human papillomavirus (HPV) vaccines. The hepatitis B vaccine—the first synthetic vaccine put into use—is made by inserting selected hepatitis B genes into common baker’s yeast (called an “expression system”) and then using the yeast to produce vaccine antigens. (In addition to yeast, current recombinant vaccines rely on bacteria, mammalian cells or insect cells as expression systems.) Yeast-based vaccines have been linked to a rise in autoimmunity due to the similarity between a yeast component and human glycoproteins. Moreover, because subunit vaccines provide “no guarantee that immunological memory will be formed in the correct manner,” they “demand” the use of potent adjuvants. The Gardasil-9 vaccine (for HPV) contains more than twice the amount of aluminum adjuvant as Gardasil. Live recombinant vector vaccines are reputed to be “safer than live vaccines made without recombinant technology and more effective than ‘killed’ vaccines,” but doubts about this assertion recently arose in the Philippines. The country suspended rollout of the world’s first approved vaccine for dengue (Dengvaxia) after reports emerged that the four-strain live recombinant vaccine had resulted in deaths and worsened disease outcomes. Pathogenic bacteria that have an outer coating of sugar molecules called polysaccharides can fool the immune system and enhance the bacteria’s ability to cause disease. Over the past three to four decades, two types of vaccines have targeted those bacteria: the older unconjugated polysaccharide vaccines and polysaccharide conjugate vaccines that chemically attach bacterial coat antigens to a carrier protein. The Haemophilus influenzae type b (Hib) vaccine was the first conjugate vaccine to be licensed and added to the U.S. vaccine schedule, along with subsequent pneumococcal and meningococcal conjugate vaccines. Vaccine experts promote conjugate vaccines as safe and efficacious, but Hib-related reports to the Vaccine Adverse Event Reporting System (VAERS)—a passive reporting system that captures a tiny percentage of actual adverse reactions—indicate that close to one-fifth (17%) of adverse reactions are serious, including sudden infant death and neurologic and gastrointestinal conditions. Alarmingly, some scientists now are extolling the potential benefits of recombinant transmissible vaccines to overcome “challenging scenarios for efficient vaccine delivery.” When introduced into the host population, this type of vaccine would “spread autonomously and sufficiently to eradicate an existing pathogen or prevent future infection by a pathogen not yet present.” Stated another way, “for every individual that is immunized directly, additional individuals are immunized indirectly”—no consent required. Current vaccine scientists who are busily celebrating a brave new world of “rational” and “directed” vaccine development would do well to heed remarks made by a Food and Drug Administration (FDA) official at the Center for Biologics Evaluation & Research (CBER) almost 20 years ago. At a 1999 vaccination forum, the Director of CBER’s Viral Products Division described grave vaccine safety challenges that were emerging in tandem with new vaccine technologies and frankly admitted that “the technology used to make these vaccines actually exceeds the science and technology to understand how these vaccines work and to predict how they will work” [emphasis added]. This startling statement suggests that now, more than ever, vaccine safety claims need to be rigorously and carefully evaluated. In Part Two, World Mercury Project will explore how vaccine technologies are outpacing scientists’ ability to evaluate vaccine safety. *Article originally appeared at World Mercury Project.